This past weekend, I took Audrey to her FIRST MOVIE THEATER MOVIE EVER, Brave. I’d planned this in advance because our weekends are so booked this summer, and I invited my film connoisseur friend, Maria, along for the ride. Maria and Audrey are big fans of each other, and Maria’s also a big fan of films (& she’s famous! She made a cameo appearance in The Dark Knight), so the combination seemed perfect. Of course, The Dark Knight Rises shooting in CO happened two days before we had planned to see this movie, so I had to channel my own bravery to bring her to the movies. I talked this up so much and she told her teachers and friends all week long that she was going to see a princess movie with mommy and Miss Maria! She was in awe of the theater. She just sat there staring at the screen while Maria and I tried to talk with her and explain things to her. Audrey was just like, “okay, whatever, I’m watching these things on this huge screen right now so please don’t bother me!” and we even got blown off by her with the “smile & nod” move a few times. She was really into the movie itself but there were some scary parts (I had no idea it would be like that!). Unfortunately, they involved bears, which happen to be her current fear (she & Stephen Colbert would be BFFs). When it got really scary, I felt this light stroking on my arm and it was Audrey wanting to crawl into my lap. There were no teas from her though (can’t say the same about other kids in the movie); she just her intently stared at the screen the whole time with big wide eyes. After the movie, she took a few minutes to return to normal and wouldn’t really respond to anyone. She just wanted to be held and snuggle her head into my neck until we got to the car. I think part of it was being overwhelmed and shocked and another part was also because it was really bright outside after being in such a dark theater. Caroline’s now clapping like a fiend! She started when we were at my cousin’s wedding (Jul 7) and is doing it constantly now. I can’t believe how big she’s getting; she is not my little newborn anymore. In another discovery, we found out that Audrey deals with physical pain in a very similar way to me. Many times when she gets hurt, she will show no reaction, & will quietly go off by herself. She won’t always cry, which is interesting because this is how I deal with pain (hence why my labors are so quiet). 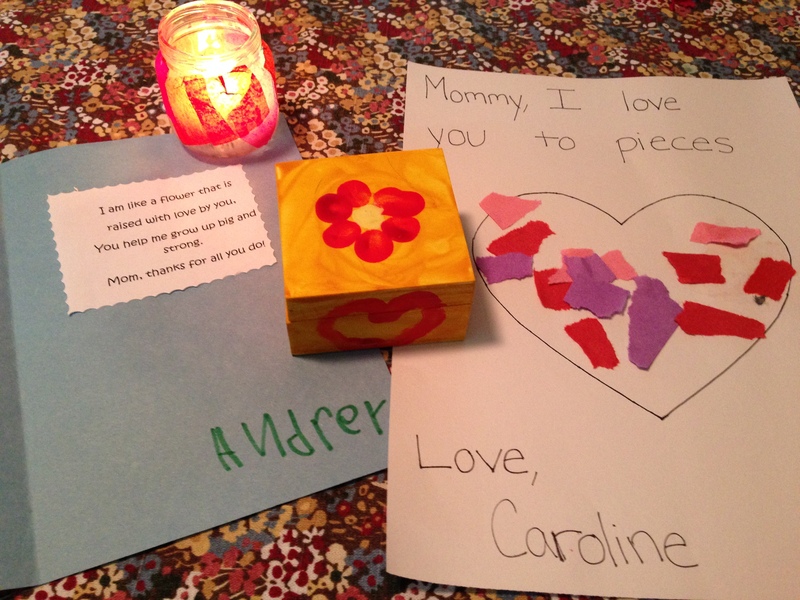 It is constantly enlightening & humbling to see your children develop characteristics that come straight from you. Yesterday night will go down as one of those nights in my life that I will never forget. We had just returned from our trip to Buffalo for my cousin’s wedding (more on that later), and we had put the girls to bed a little earlier than normal since they didn’t really nap in the car. About 45 minutes after we left Audrey’s room, we heard her start to whine. I was cutting an apple in the kitchen so B went to go check on her. A minute later, she shuffles into the kitchen and I hear B say, “look at your child.” I look up and gasp because Audrey is SO WHITE. I thought she was sick or something because she was as pale as a ghost. When I asked what happened, I found out the truth: she had gotten into diaper cream that was on the top of her dresser and smeared it EVERYWHERE. It was all over her arms, hair, legs, bed and her Princess Baby & Abby Cadabby dolls. Once we figured out that she hadn’t ingested it, it was REALLY hard not to laugh. She looked so ridiculous! As I mentioned before, we went to my cousin’s wedding in Buffalo this weekend and we had a great time. The wedding itself was beautiful, and the company was the same. It’s always so nice for Audrey to be able to play with other little kids in the family and I only wish it could happen more often. She had such a ball, and the cousins were all so cute together. I have lamented my lack of a healthy relationship with a sister many times in my life, but this trip also made me realize that I don’t necessarily need someone with the title of “sister” in order to have a close, sisterly relationship. I am blessed to have cousins who can also fill that role in my life! I keep telling myself I need to write a blog post but I never find myself having anything revolutionary or unique to say. Usually I will think of something I have a major opinion on sometime during the week and tell myself “Oh, you should blog about that” (and then never do), but lately, I haven’t even had that desire. There is nothing too new & exciting going on for us now, though that isn’t to say we aren’t having a lot of fun these days. It is pretty impossible to have a miserable time when you have a crazy toddler who loves laughing and playing and tickling and imagination. Caroline hit 7 months old this week & she is such a chub. I am so in love with her that I can’t even describe it & I really cherish my Care-Bear snuggles. She’s definitely turning into a mommy’s girl lately and I am not complaining! She is doing so well with her sleeping and she’s so consistently happy now. She loves her solid foods (still) and is so close to sturdily sitting up on her own. She can more or less sit up on her own now, but I still feel like she’s a little bit of a Weeble Wobble. 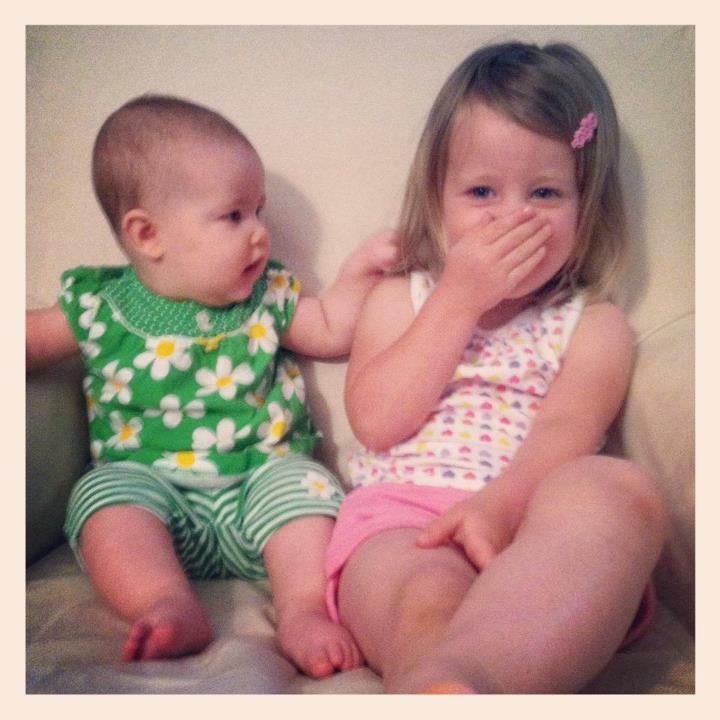 She’s also a chatterbox who loves to mock her sister. Audrey was throwing a tantrum one day and Caroline just stared at her and started shrieking at the same pitch as Audrey (with the same breaks in shrieking as her) and then she’d just laugh & laugh & laugh. B & I were dying. Funniest thing ever. Audrey’s imagination has been running wild these days and it’s so fun to hear what comes out of her mouth. She’s SO funny and it’s hilarious to teach her things and then to hear what she picks up from us. Yesterday, B went downstairs to grab a beer or something and was taking a long time, so I told Audrey to say, “Stop picking your nose, Daddy!” when he came back up. She thought it was the funniest thing I’ve ever requested, and she was like, “Daddy gonna say “whaaaaaaaaaaat? '” (because whenever she says something silly to him, he says, “WHAAAAT?”). I just loved that she knew that about Brian and I LOVED that when he came upstairs, she actually told him to stop picking his nose. He starts cracking up because he has no idea where that came from and that caused me & Audrey to laugh until we cried, too. Toddlers are the greatest! Things we have done lately include seeing Elmo and USO’s production of Sesame Street Live at Bolling AFB (of course Audrey LOVED it), meeting 2-week old kittens, & a UVA baseball game (which A is still talking about…last night, out of nowhere, we heard her yell “BASEBALL!” from her room when she was supposed to be sleeping). 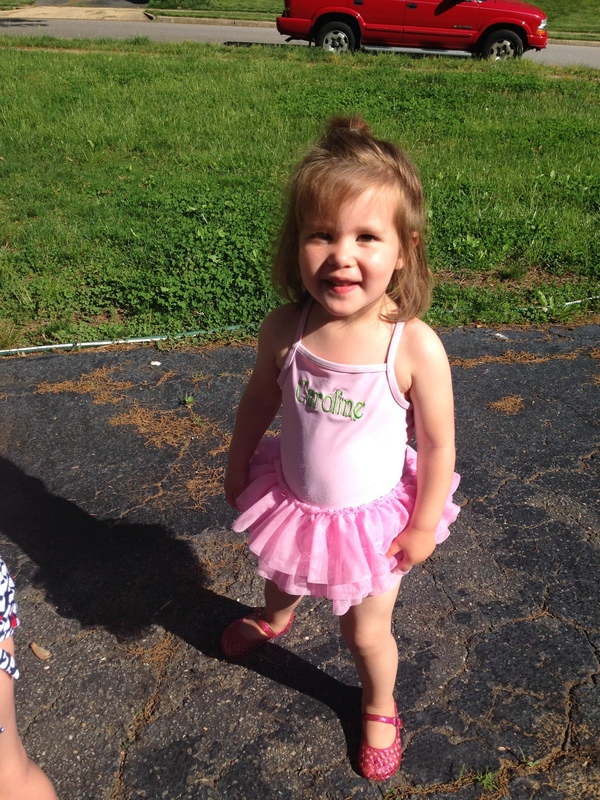 Swim classes for both girls start this month and I’m interested to see how Caroline takes to the water! Lately I’ve been feeling sort of down about the fact that I don’t get to spend as much time with the girls as I want to. I think a big part of it is that when Audrey was 6 months old (like Caroline is now), I quit my job at UGF to prepare for our PCS to Virginia. That meant I got to spend 6-7 months with her instead of being a working mom, and I loved that time so much. I am really sad & feel guilty that I don’t get that time with Caroline at all and I guess I’m just feeling like an insignificant part of their lives. It seems like both of them are growing so fast and I feel like I don’t get to actively participate. To add insult to injury, last night at bedtime, Audrey bumped her head and started crying. The first thing she said was, “I wanna show Miss Leonor (daycare teacher)!” and she said it twice more. Same thing happened this morning when she scraped her knee on the way to the car. Ugh. It was like a dagger to the heart & I teared up on the spot. It has been hard not to beat myself up about these things lately. My mind constantly says, “Well, of course Audrey calls out for her daycare teacher first. Why wouldn’t she? 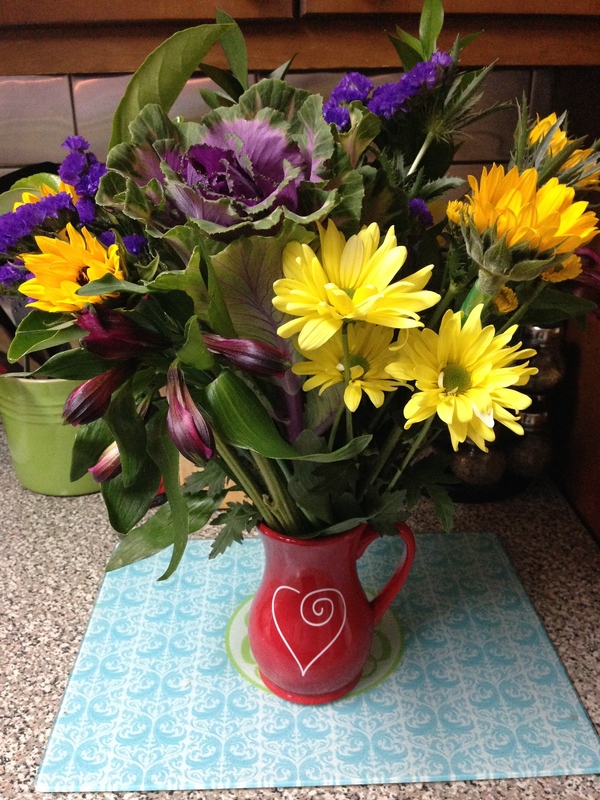 You’re never there!” or “What did you expect from your previously amazing nursing baby? You are not able to nurse her as frequently anymore. Of course she isn’t going to want to anymore!” So frustrating, disheartening & depressing. I know there are perks to being a working mom (right? ), but sometimes it’s just hard to see them. Yesterday was quite the busy day for the girls in the family! It was Take Your Daughter to Work day so Audrey accompanied me in the morning and we had a great time. Caroline also happened to turn 6 months old yesterday (!!!!!!) and so I took her for her 6-month appointment and shots in the afternoon. We’ll start with Audrey’s and my adventure in the morning. It was so much fun to bring her in & of course she was spoiled rotten. She was sugared up and given lots of little trinkets (crayons & a coloring book from one of my coworkers and then tons and tons of bead necklaces and a tiara from some of the academic programs I work with). I got the bare minimum amount of work done and then the rest of the time was spent doing fun things like escorting her around campus. She had a few other little friends to play with as well, and she was so tired by the time we got to the car that she fell asleep before we even got to school. Of course, we couldn’t take our beads off when we sat in our car seat so I think I spent a good 5 minutes trying to buckle around them! Let me just say that I cannot believe we have a child in the 52nd percentile for weight! It is so crazy to me since Audrey never hit that. I love all of Caroline’s little chubby rolls, and the doctor says she is right on track with weight vs. height, so at least her chub isn’t TOO chubby! She seemed to take her shots a little bit tougher than she did previously but it resulted in lots of nice snuggles at home afterwards (but a little longer to get her settled in for the night).